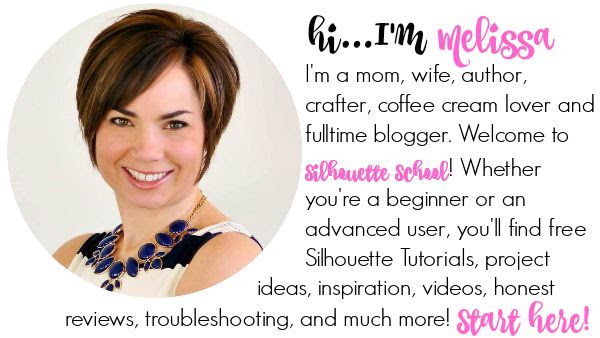 In the two years that I've been blogging on Silhouette School I've purchased and reviewed a lot of items and I always, always, always give my honest opinion. 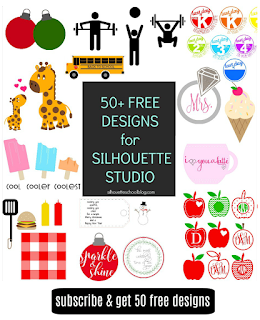 I've found a lot of products I love and I've recommended them all to you time and time again - like Designer Edition and Pixscan and the Deep Cut blade - but there are just some Silhouette-related products that I have to tell you: Don't waste your money. 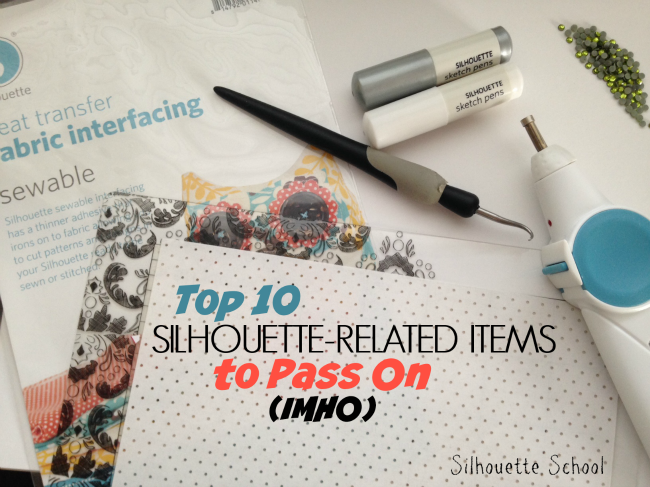 Here are my 10 top Silhouette-related items I suggest you pass on in no particular order (these are all items I've used myself). Silhouette brand Vinyl and HTV - The quality of the vinyl and HTV just can't complete with the industry standard: Oracal. If you get some Sil brand vinyl with your machine, it's fine to practice with, but after that stick to the good stuff- especially if you're planning to sell. 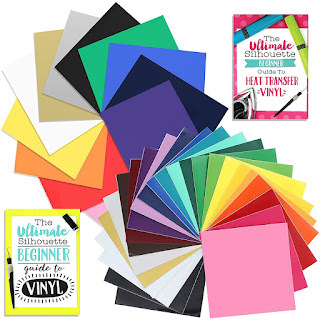 40 Pack of Vinyl - The 40 sheet variety pack of adhesive vinyl sold on Amazon is seriously lacking in the adhesive department. The price might be right, but in this case you get what you pay for. If you're looking for a variety pack, get the 30 pack. 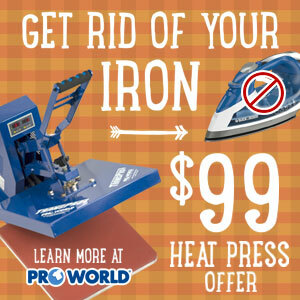 Rhinestone Setter - The Silhouette Rhinestone Setter runs through batteries and fails to heat up to a temperature that's hot enough to effectively apply rhinestones for the long haul. Pass. 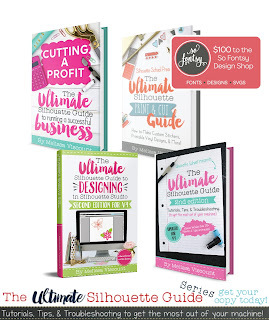 Silhouette Interfacing - The Silhouette brand interfacing works fine, it's just entirely too little for the high price. Heat and bond or another interfacing works just as well and for a lot less money! Silhouette CAMEO or Portrait Cover - Who needs a cover? 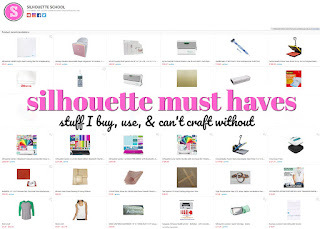 With as much as you'll be loving and using your Silhouette machine no dust will ever settle on it! Of course, all opinions are my own and perhaps you don't agree...so tell me your thoughts by leaving a comment below. I certainly agree with you on the pens and the vinyl. I only got small quantities to start out, so I am still compiling a list of "who to buy from". I really appreciate being able to read fact, not hype. Buying supplies for any craft is expensive; wish I had known this when I purchased my Cameo last March! I learned a long time ago not to buy the hobby material when I used to own a Cricut machine. The materials (vinyl, htv, etc.) usually doesn't hold up. I figured the same would apply to my Sil (although I certainly am glad I switched to the Sil -- I absolutely LOVE it!!)! The one thing I continue to use from my old Cricut days is the old tool kit. The weeding tool is sublime! What do you suggest we use for weeding instead of the silhouette hook? I use those super pointy, curved tweezers for weeding. I don't think I could manage without them. And, as far as HTV goes. I really love Siser EasyWeed. That's all I use. Love my Cricket accessory kit comes in a great little case with everything you need! I bought a set of tools at harbor freight works great. I have to agree on the pen holders, the sketch pens, and the vinyl. All were disappointing. I found out about the Amy Chomas pen holders right after I bought the silhouette package. Mine are still okay after dozens of uses, but they don't like the softy grips on most of my gel pens. Karen, I got a newer weeding hook in the model section of Hobby Lobby. $3 and it is much sharper. My problem with the Silhouette brand one is that after a while, the hook swivels around in the wooden base. A single piece tool is much better. Also, I got an amazing deal on the Mint, which is still in the box while I determine if there are other sources for the stamp 'blanks'. The stuff is crazy expensive! Any suggestions? I have the Silhouette Cameo bag which I love. It is great for holding my Cameo, mats, printer, and computer with room for cords and miscellaneous stuff. Have found that it works well for when I go to 3-4 day crops but I don't have a need for it to fit in the carry on luggage compartment of a plane. Amazon is not offering the 30 pack of assorted vinyl - says not available on their website. I have not used some of the things you mentioned, so it's great to read your list. The last item - the dust cover - made me chuckle. 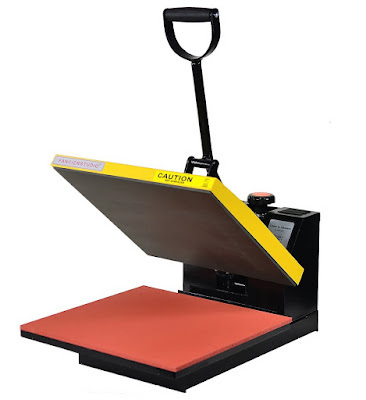 When I first got the Silhouette Cameo, I got a nice cover and only put it on the machine when I am going away. I use the machine every day so the cover sits to the side! Great to see an honest review of these items. What pens do you recommend if not the SIL sketch pens? It's one of the features I haven't used much but like the idea of as I cannot draw for nuts! I have not had any problems with sharpies. Used with the other pen holder she talked about. I also tried the Cricut weeder ...too fat. I agree with you on several of the items mentioned, especially the vinyl, and the sketch pens dry up to fast! AND you can't tell how much ink is left in them to ensure you can finish a project. I LOVE my Silhouette and I love the customer service that they give, but some of the products need quality attention. Thanks for your blog , I follow it consistently. I agree with most everything you mentioned (and thanks for such a honest review!). I used my Silhouette CAMEO bag for when I went on a scrapbook retreat and it was well worth the money (I got it for less than $50). I was pleasantly surprised that it held so much; my machine, mats, laptop as well as several other items. Although, I did have to watch a video to learn how to set it up lol :). I do love the Chomas holder. And instead of using the sketch pens, you can use so many other types of regular pens and markers instead. Hi Melissa, Thank you for your produce review, I like your honest opinion on how things work or not work!! I haven't had any issues with the Silhouette Vinyl but I did buy some Oracel and had a problem with it not being sticky enough. I just wonder if you could tell me why you don't like the Silhouette vinyl. Is there something that I don't know about that will happen. I have made dozens of gifts with it and haven't had anyone say they had a problem. I also buy the Vinyl Ease 3o pack from Amazon and I really liked that too. The only problem with that is the sheets are not wide enough for everything I want to make. Ditto on the dental tools for weeding. I got mine from Harbor Freight, SUPER inexpensive!! Thanks for your reviews! I bought a Silhouette weeding tool at Michaels a few weeks ago and it was really sharp. My stabbed finger can attest to it! I wonder why there is a quality difference. Thank you for your reviews. I haven't had an issue with my Sketch pens and use them frequently and no problem with my weeding tool either. I did buy the cover for the Cameo and it's nicely made. I do use my cover to keep it pet fur clean as I have 5 indoor pets. As far as the Silhouette vinyl, I didn't like it and do use another brand. I was reading some info you discussed about Amazon June 15 sale day. Your top items to put on a wish list for that day. I lost the link and can't find it again. Can you direct me me to that info. I have the sketch pens and have had some go dry and work on and off. I love the cover keeps dust off and also the sun off as mine sits by a window. I also have the pen holder and hate it. Doesn't work will save up to purchase the one mentioned. I did order a holder that held markers but gave it to my daughter never heard if it worked and could not find it again. I thought it was a Silhouette America product. I would not need to take a bag on a plane so might like a bag with wheels when going to friends houses. Will see. Agree vinyl needs to be gotten from other dealers. Thanks for all the info. AAAAHHH, the pen holder..........have to agree what a waste of money, i actually complained to silhouette a it, they said they were working on it, i just use tape with other pens and markers it works just fine. the silhouette pens work just for me. Dental tools from the dollar store work great. I do like my dust cover. I have nosy kitties that hang out in the craft room and found cat hair on my Cameo. I use the pen adapters ALL the time. I love them. They fit wonderfully with sharpie fine pens and I use them to write on cards. It looks awesome! They also fit frixion clicker colored erasable pens (available on amazon) that write wonderfully. Speaking to my own experience, my Sketch Pens are still writing fine 6 months down the road. For me the cover is a godsend. I have four cats and without the cover my machine would constantly be clogged with cat hair. I washed it once and threw in the dryer by mistake; Silhouette sent me a new one even though it was my fault it shrank! I love the pen holder/adapter. I have had no issues with it. I do not see the point in buying a more expensive one. I use my Cameo cover only when I take pictures in my craft room. Lol! The cover I actually bought at the same time as my Cameo bundle. I knew it was going to be hanging out in my glass studio and I wanted to make sure it was protected from all that glass dust. :) I like the fact that it's easy to just put on, no straps, clips, etc. The rest I will look at carefully! I'm so with you on the pens! I love my cover though. It makes my desk look pretty for the hours I have to be working for the man and not able to be creating.